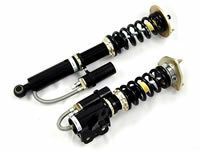 The shortened, high-performance shock absorber for lowered sports cars. Lower doesn't automatically mean better. It is not the appearance of the car that determines its handling, but the optimal tuning of suspension, springs and shock absorbers. With this in mind BILSTEIN has specially developed the B8 Sprint damper for cars with lowering springs.